My friend Chris Rylander and I first had class together in third grade. By fifth grade, he’d invited me hunting at his ranch. We’ve hunted 23 out of the last 26 years. Our hunt this year went from Monday, November 19th through Wednesday, November 21st. We started out Monday morning on the Sandy Creek ridge, one of our favorite spots. From the ridge there are two vantage points, one looking North and the other South. This morning I took the South view and Chris the North. I had my son Jonathan, 8, with me as well. Jon and I saw quite a few deer including 6 or 7 bucks and a nice 8 point. He was wide, but his tines were short, so he got a free pass. About 8:30 or so, we heard Chris shoot. I told Jon it must be a good one, because Chris doesn’t shoot that often. Chris’ deer is the first pic in the slide show. He called this deer in with a grunt call from several hundred yards away. A well placed shot to the neck at 100 yards and the deer was his. This is one of the biggest deer I’ve seen off of this place in 26 years. Monday evening I had the pleasure of taking both of my boys hunting. At 7 and 8, they’ve both been out before, but I’d never before had them both with me on a sucessful hunt. We started out at a place called the Rock Fort, overlooking a valley. We didn’t see any deer, so we stalked behind the ridge over to the Watermelon Rocks. As you might suspect, the Watermelon Rocks are a favorite site for eating watermelon. We saw a deer working our direction on the mesquite flat on the other side of the fence. Before it went into a group of trees I got the binoculars up in time to see that it was a good buck, but not to scope it out well. It crossed the fence and I got a good look at it for a few seconds… definitely a shooter. Based on where it was headed, I knew which gap it would enter next. Jared was the first one to spot it entering the gap. It never stopped walking, so I took a moving shot at 150 yards and the deer fell in his tracks. After a few fist bumps and high fives, we headed down the hill to the deer. The boys were quite interested in the field dressing and anatomy lesson. 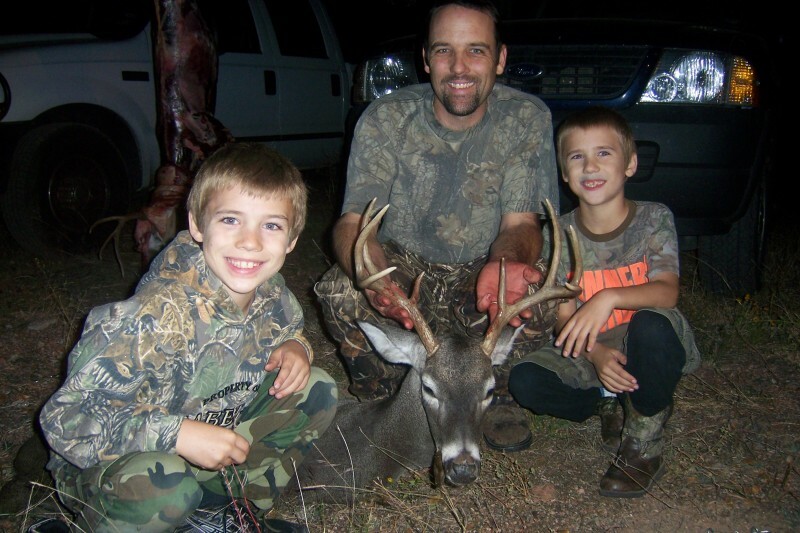 One of the first things they told Shana when they got home was, “I got to touch the liver with my bare hands!” The buck wasn’t a monster, but he was a nice one for the area, and definitely a good one to shoot with the boys. It’s the second pic in the slide show. 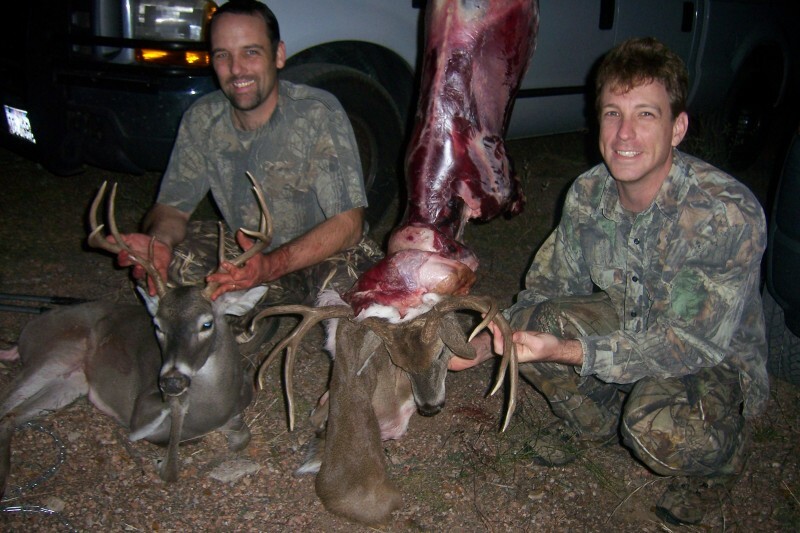 Chris and I have hunted together for a long, long time, but I don’t recall a trip when we both got bucks this nice on the same day. The third pic is both of us with our deer together. Tuesday morning came early. Chris and I hiked together to the north east corner of the ranch. The air was cool and still. 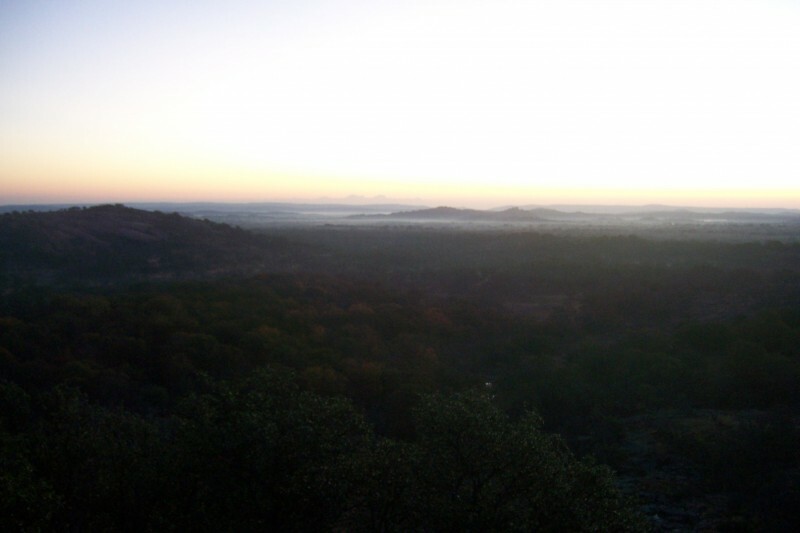 As I reached my perch on the top of a hill nestled among some granite boulders, bats began flyin by. It was a little creepy. The sunrise was beautiful! There was a little fog in the valley, making the hills look like islands on a lake. The “island” pic is the fourth one in the slide show. 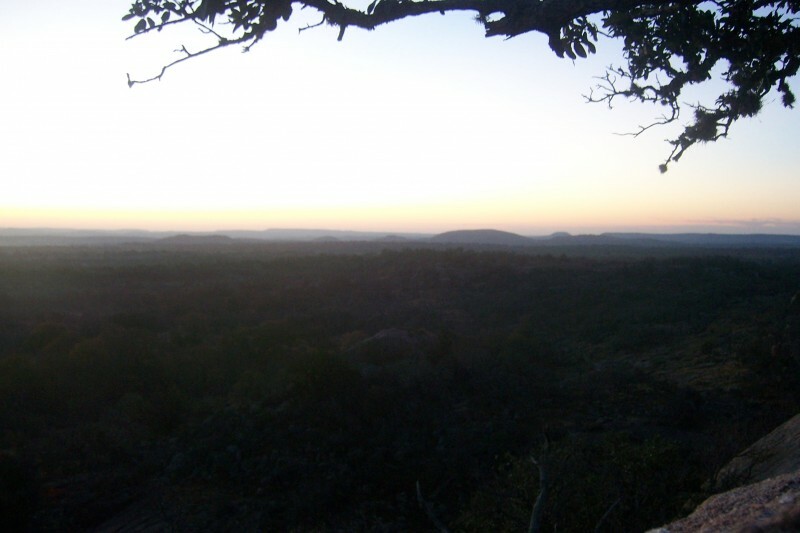 To the south I had a good view of Enchanted Rock, the fifth pic in the slide show. I saw a great buck that morning, a very heavy horned main frame 8 point with a nice kicker on the left G2. Since he was on one of the roughtest parts of the ranch, and since I already had a decent buck in the freezer, he walked to live another day. Maybe he caught up with that doe he was chasing so we can hunt his offspring a few years from now. I also saw an aoudad Tuesday morning, but didn’t take the shot. After we worked our way back to the truck we set to the task of building a bow stand at one of Matthew’s feeders. 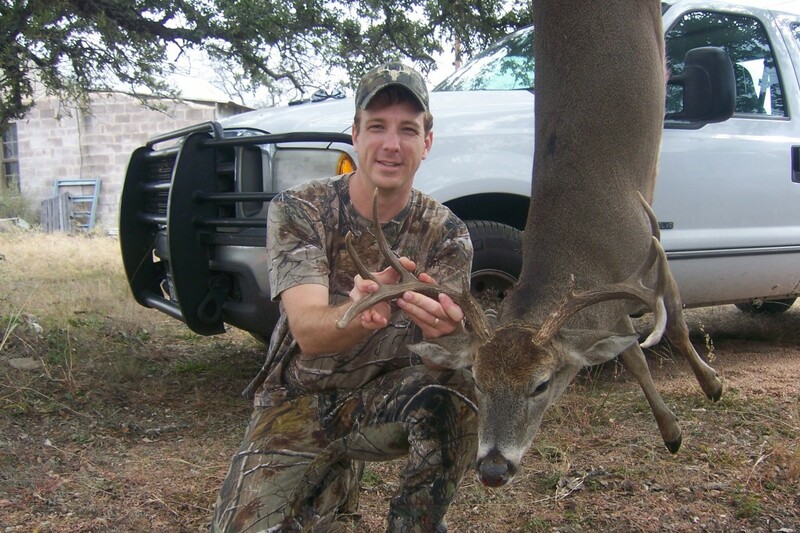 I bow hunted the stand that evening and missed a decent buck, an 8 point very similar to the one I killed. I was fortunate to take a doe from the new stand on Wednesday morning, the fifth deer I’ve taken with a bow. The doe came in early with two yearlings and stood directly downwind of me for no less than 10 minutes without spooking off. I made a nice double lung shot at about 12 yards. Those are the tales from the 2012 hunt. Each place we went on the ranch we re-told stories of things we remembered. Thanks to the Rylanders for their hospitality, and to Chris for many years of friendship.